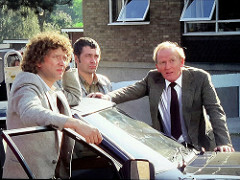 MY A-Z OF WHAT I LOVE ABOUT "THE PROFESSIONALS" - BODIE 3.7 . you'll never walk alone ! MY A-Z OF WHAT I LOVE ABOUT "THE PROFESSIONALS"
C...... Capri, the iconic car of "The professionals"
I...... Inseperable , which these two are , never far apart. O...... the OJUKA SITUATION , lots of partner worry , love it. and there you have it , my A-Z of why i love "The Professionals" so much . Thank you ..I'm glad we agree .Thank you for looking and leaving a comment. Sorted ..how could I forget Y ..thanks for the reminder. thankyou and glad you agree with me , thankyou for letting me know. that's so good to know thankyou and many thanks for taking a look. Glad you like it and thankyou so much for taking the time to look. i knew those xxxxxx's would count for something, thankyou so much for taking a look and commenting. I LOVE it! Yes, the bus stop scene is a great moment, isn't it. Your x solution works well - and there's always x-rated, for what goes on after each op. thankyou , glad you enjoyed looking at it and ooooh x rated , that also sounds a good one to include. Great idea! I enjoyed seeing what you had for each letter. Heh, X-rays are definitely a part of their lives. Oh, and queue, yes! This was one of the moments that really stood out, for me, when I saw my first eps. I was surprised at how 'meta' that scene was, for the era. some better than others but each one holds something wonderful So true! xxxxxBodiexxxxx and xxxxxxDoylexxxxx definitely counts! thankyou , glad you like it . I think xxxxxxxBodiexxxxxx and xxxxxxDoylexxxxxx sounds good .Thanks so much for commenting.